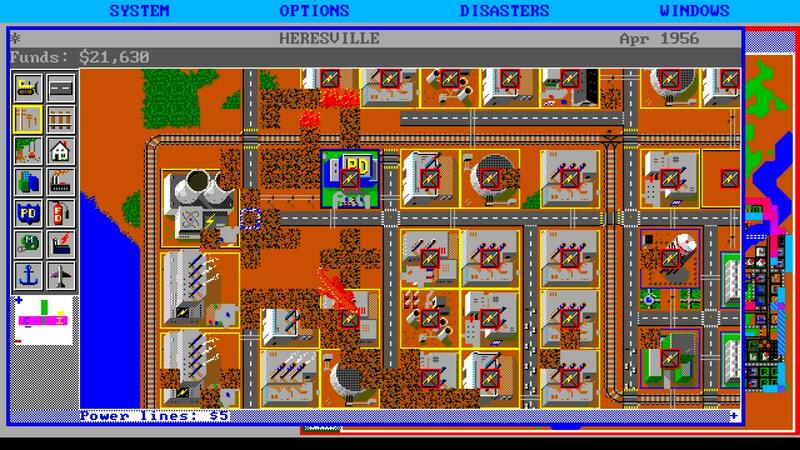 When SimCity was released in 1989, it was clearly the beginning of something special. Any game that makes it into schools and the lexicon of real-world urban planners has to be doing something right! City management gameplay captured the attention and imagination of a large portion of a computer savvy culture. 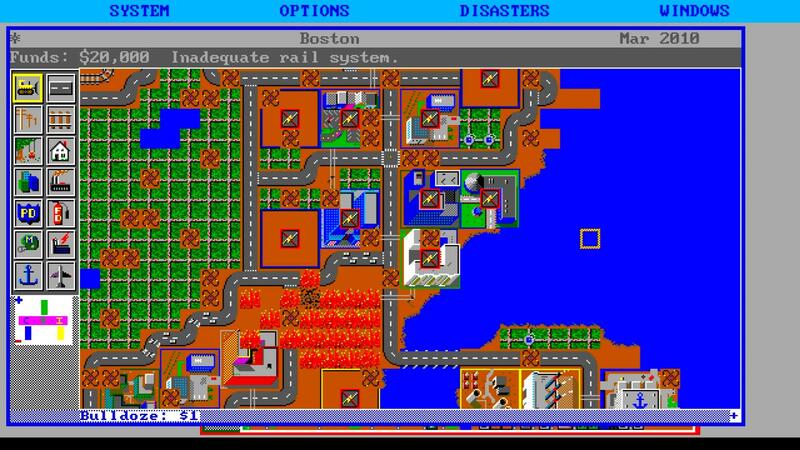 Beyond that, people who didn’t know a thing about computer games knew what SimCity was. 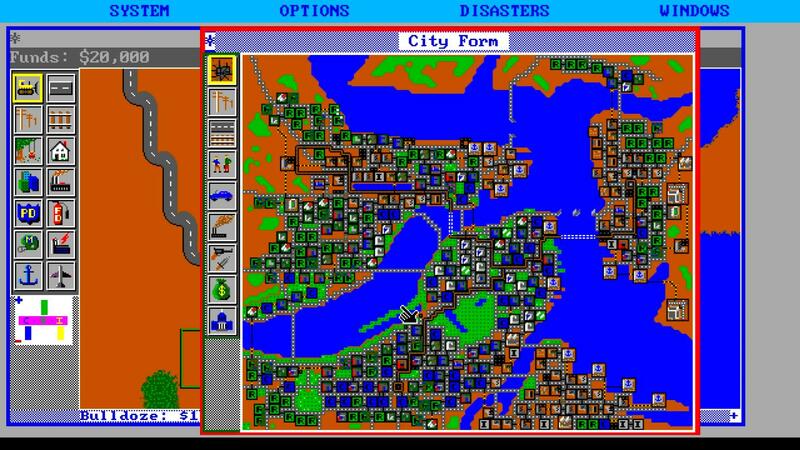 Playing it in 2017, I don’t think it’s possible to appreciate SimCity for what it was when it came out. A short half an hour of play time is all that is needed in order to see the building blocks of a series that’s remained relevant thirty years later. Unfortunately, time has been cruel to the original game’s accomplishments in that its own sequels have managed to improve upon it in nearly every way, rendering the original release obsolete. The principle of SimCity is simple: build it and they will come. Establish a city on an empty plot of land, provide infrastructure and zoning, then sit back to watch it grow. It’s a game built around what the developers call a “system simulation”. Systems are sets of rules that determine how the city behaves. Tools are the hands-on gameplay elements a player uses to manipulate those systems. Everything that happens onscreen is a result of the cause and effect relationship between the rules and tools as used by the player. For example, residential demand is a system that is governed by and responsive to job availability, tax rates, and quality of life elements such as crime and pollution. If there aren’t any jobs available, or if crime and pollution are too high, there may not be any demand for new residences. But as more jobs become available and land values climb, more citizens – referred to as “Sims” in game – will want a place to live. Building residential zones satisfies the system’s immediate need, which in turn generates other needs which need to be fulfilled. There are other systems like traffic, land value, and crime that interact and feed off one another. It’s your job as the mayor to use the game’s tools to manipulate these systems to the desired end: turning a barren plot of dirt into a bustling megalopolis. Cities begin with the creation of a power plant. Two varieties are available, coal and nuclear. A nuclear reactor will only set you back $5,000, so it’s the logical choice! Draw some roads and power lines from the plant to your nearby industrial zones. Belching pollution and providing a place for miscreants to hang around, industry nevertheless provides a means for your Sims to earn living. Residential zones are ideally placed a ways away from the industrial arm of the city. Waterfront properties are particularly desirable. Commercial zones can be freely interspersed with residential areas. Though busy, commercial squares carry less negative effects than industry. As the city grows Sims may demand police and fire coverage, as well as the occasional sports stadium. Everything costs money to build, and roads and services have recurring maintenance costs to consider. Build too much too quickly and there’s a chance the city will go bankrupt, ending the game. Debt isn’t the only adversary in the game. There is an entire list of disasters that can and will befall your city. Floods, tornadoes, earthquakes, nuclear meltdowns, and even a giant radioactive lizard are capable of reducing your city to rubble. When I dove into the game about two weeks ago I’ll have to admit I didn’t expect to have much fun playing a twenty-eight year old city simulator. Given the progress other games have made with time, would this first offering be too basic to enjoy now? The answer to that question is yes. At first. Those first ten to fifteen minutes are the most difficult! Ugly. Slow. No details. No real control, at least when compared to other games in the series. A large part of the struggle is that the game doesn’t explain itself. It’s not supposed to. All of those systems and tools are explained in depth in the game’s manual, which is surprisingly difficult to find online. Guided by a manual or not, keen observation pays off and once you start recognizing the systems it’s easy to fall into a rhythm. SimCity is essentially a video game version of Newton’s third law: For every action a mayor takes, the city will respond with equal but opposite reaction. Sims demand a place to live? Put some residential zones down! Now those new residents need jobs? Time for some industry! 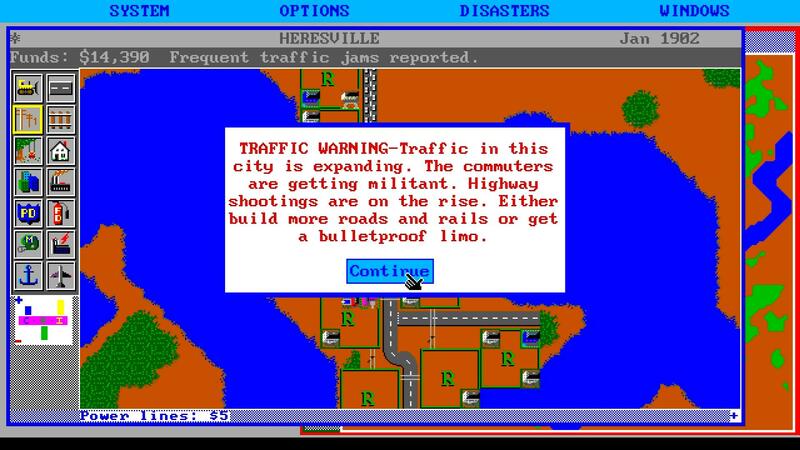 Traffic on the commute is terrible and people are going to start shooting each other? Well, there’s not much I can do about that. People just need to learn to be nice. While that core gameplay loop is fun, it is quite short. Once you’ve constructed an area, there’s very little reason to go back to it. If it functions well, it will keep working with no input from you. Making minor tweaks to existing areas is easy since nearly every building has the same footprint. If you need a police station, simply demolish one zone and plop one down. Easy, yes, but not requiring or allowing much creative expression. Trying to redesign or renovate a renovate a section of a city because of that standard zone size. Adding a rail line next to a road usually means you have to demolish an entire block of developments, and at the end of it you’ll have a line that’s 2 tiles wide with nothing that can fit there. If you’re meticulous and know what you’re doing it’s possible to plan in such a way that no renovations are needed, but where’s the fun in that? Disasters are something of a saving grace in that they present an opportunity for an unintentional, albeit not always necessary, remodel. The closest this game gets to requiring creative design is when a nuclear meltdowns leaves behind tiles of radioactive waste that cannot be used for anything. Ever again. Handing out a rating of “Don’t Bother” to an all-time classic like SimCity feels more severe than I intend. It’s a landmark title, to be sure. If you have any interest in city-building or management games, you owe it to yourself to play this for at least an hour. However, it almost ends up feeling more like a tech demo or proof of concept than a fully-featured game. In 2017 it’s an interesting history lesson. SimCity 2000 is the realization of the vision presented in SimCity, and as such I’d have to recommend SC2K as the starting point for anyone interested in the series. The birth of the Sim franchise. Simple, but all the basic elements are there. First look at unique flavor of humor found in games made by Maxis. Very basic when compared to later games in the series. You can see everything the game has to show you in an hour. Top-down perspective and lack of zoom affords a window of the action. SimCity is not available for purchase anymore. The original Mac and DOS releases have entered the public domain, so the game can be enjoyed online for free here: Internet Archive – SimCity 1989. Be warned that you cannot save your game while playing online. Also, there’s a version of the game available for free on the Windows store called RetroCity. This is a program that takes the source code of the original game and adds a few new features like zooming and a more polished interface. The downside is that there are a few weird graphical glitches and some of the menus have a weird layout to fit the Windows 10 style. 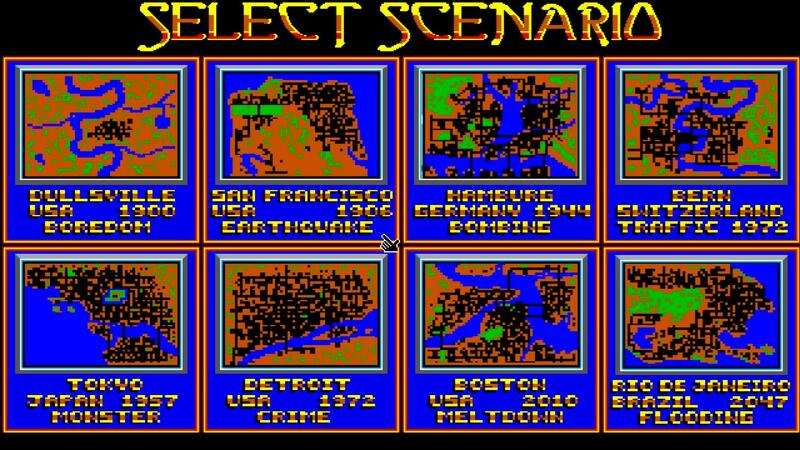 While it doesn’t contain the original challenge scenarios, it does allow saving and loading of cities. Well since you called me out on Facebook, lol, I guess I ought to explain the nature of my disagreeing viewpoint. :-p SC Classic is, believe it or not, the ONLY SC game I’ve ever played. And I played it in the mid-late 90s when I was still a young’un in middle and high school. So it has a significant nostalgia factor for me. And, you know, I wasn’t a big gamer or anything when I was a kid. I had a select handful of games that hold special memories for me – to the point that I even associate certain games with music I used to listen to while playing them. I remember playing this game and thinking it was neat. I loved the idea of building my own little town/city/world in a time when I didn’t feel like I had a lot of control, but was slowly inching my way toward increased responsibilities and independence. I grew up with an Apple computer that my family owned and made use of for several years (my parents weren’t the type to go out and buy new computers), and then a friend of my mom’s actually gave us her used IBM with a collection of games that was probably pretty small by today’s standards (definitely small by yours!). But I’d never had so many games at once, so I was pretty impressed by a color(?!?) monitor and point-and-click anything. I loved watching the little “cars” driving around on the roads I built and I cursed those months-long tornado attacks. Oh, those tornadoes! I’d follow behind them fixing all the damage they’d caused almost as soon as they’d caused it, and then the stupid things would loop around and destroy my work all over again! Does it hold up today? Not so much… I don’t disagree with you on that. But “don’t bother?” I mean, sure, the audience for SC Classic is probably pretty small, but I believe they’re out there. They consist of people like me, who have a cemented, albeit tiny, place in their nostalgia closet for it; perhaps those who have never played any of the SC games who could start with Classic and therefore appreciate the advances of the subsequent games (like starting your exposure to Mario via Super Mario Bros. before jumping into one of the younger versions, or starting Dr. Who with Nine rather than Ten or Eleven); and maybe thorough, gaming-history-buff types. You know the ones. They’re kinda touristy; the kind of people who go to a museum and read every one of the little plaques and information displays. So maybe you’re right. For the typical, modern-day gamer, maybe this is a “don’t bother” when there are new and improved versions around. And maybe if I played one of the more recent installments I’d change my mind? But I like the analogy you used when we discussed this yesterday: SC Classic is to wooden blocks, as younger SC games are to LEGOs. The former is more limited, and maybe requires a bit more imagination to truly enjoy, and the latter presents an improvement in design and capability, giving your imagination a bit more freedom to truly enjoy.